New 52 Wally West is Black?! I’ve been waiting until the flash annual to confirm or deny but since the internet and comic geeks are having a meltdown lets dive in. So for months dc has been teasing the return of Wally west one of their biggest legacy characters from the 90’s. 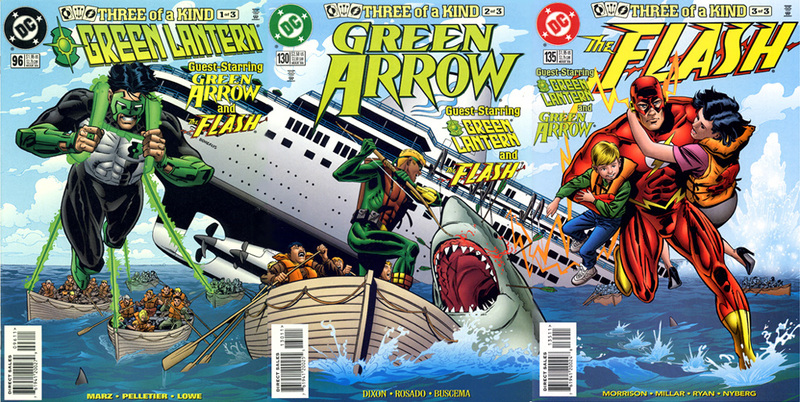 alongside Kyle Rayner/green lantern and Connor Hawke/Green Arrow they were the big trio of the 90’s. Wally was quite possibly bigger than his predecessor Barry Allen. Wally West, Kyle Rayner and Connor Hawke- I LOVE THE 90’s! A key point of who Wally was in the pre-new 52 world was his relationship with Linda Park, a woman of Asian descent. After Final crisis they welcomed their twin kids and were essentially Dc comics “super family”. Others details on this new version of Wally West include him being a teenager and half-brother of Iris West. Now while everyone is losing their minds I’m neutral to this development honestly. We have gotten a black Hawkgirl, two black supermen (President Superman and Val Zod of Earth 2) while we lost Onyx Adams and Connor Hawke to whitewash. DC is trying to shake things up and I can’t be mad at that. My Wally West had a good run and if I want to see him all I have to do is flip through an old comic. New 52 is not our universe especially if you grew up in the 90’s. Our Time Drake of the 90’s is also long gone since a central part of his characterization was being the smartest Robin/ a world class detective and being the worst fighter. In the new 52 version he is an Olympic level everything making him arguably just a miniature Bruce Wayne. What do you think of this new version of Wally West? Is this a good development? Or a Bad one? ← The X-men's Storm Is Getting Her Own Series?! They should have left thing alone. !! If not broken just leave things as they are Wally as been around for a good 30yrs or more. He’s is the best flash ever.